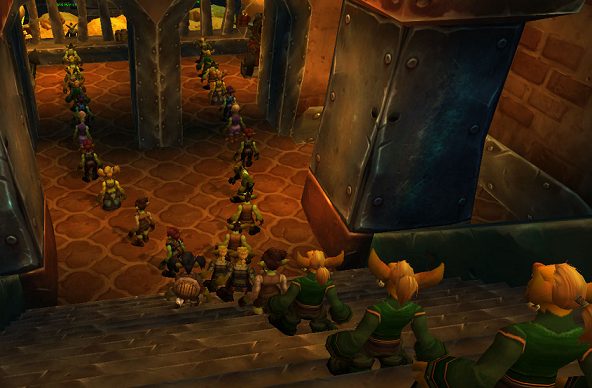 Having been fortunate to receive Cataclysm beta, I’ve been keen to try out the Goblin starter area. 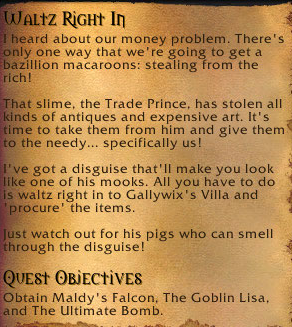 Why Goblins you ask? They can be shaman! In addition, the lore behind the race and the artwork and design of their city had intrigued me. As such, this is how I spent a few hours today and I’m going to relay my thoughts here. Be aware, this one will be image heavy and I suggest those of you who don’t like spoilers read no further. In general, I’m not a huge fan of lore and I’m one of those people that mostly skip quest dialogues in order to just level faster. I’m every developer’s worst nightmare when it comes to “immersing” me in the world simply because it takes a lot to do that. 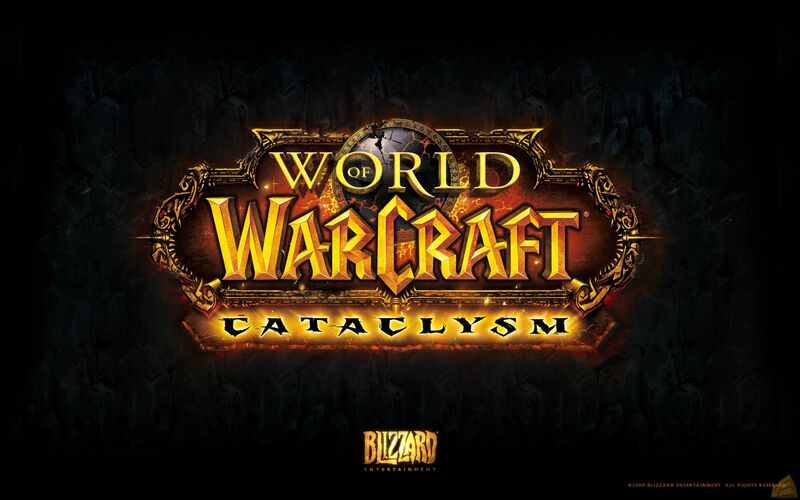 I’ve played many MMOs and I consider myself quite hard to impress when it comes to story lines. When I sat down to play, I told myself firmly that I would be paying attention to the story as it was new and important for the article. I also groaned slightly expecting that in itself to be a battle. (I’m more a whizz round the city and take some pretty pictures kind of girl.) Imagine my surprise then, when a few hours flew past painlessly and I can honestly say that I knew (and enjoyed) the opening story. The design of the city itself is amazing. It truly feels like a seedy coastal town built on an industry of mining Kaja’Cola; the ultimate brain energy drink for the ever ready Goblin (now infused with 100% more ideas.) The city is large and sprawls along the side of an active volcano. A crazy road system staggers throughout the city and as one of the first quests in beta, you receive a car to help navigate your way around. 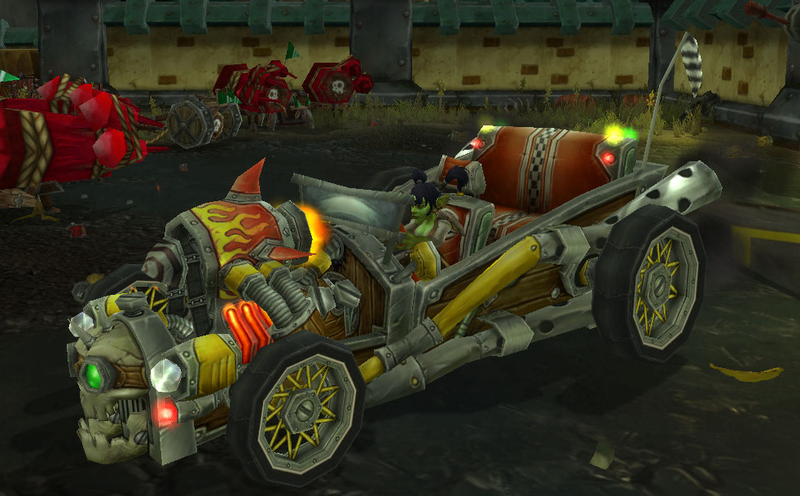 The car makes questing feel much less tedious. It looks great, it feels immersive and it removes that feeling of being a total noob running from A to B at a snail pace. There is no where you can’t drive (though there are places that are too small to accurately navigate. Be warned, however, the locals soon become infuriated with a lack of respect for pedestrians! The city itself is split into it’s own distinct areas. In addition there is the ghetto area of Dredge Town, where shady individuals can be found discussing organised crime and where you’re later sent to recover a few debts and Kajaro Field where Goblins gather to gamble on some peculiar sporting activities. 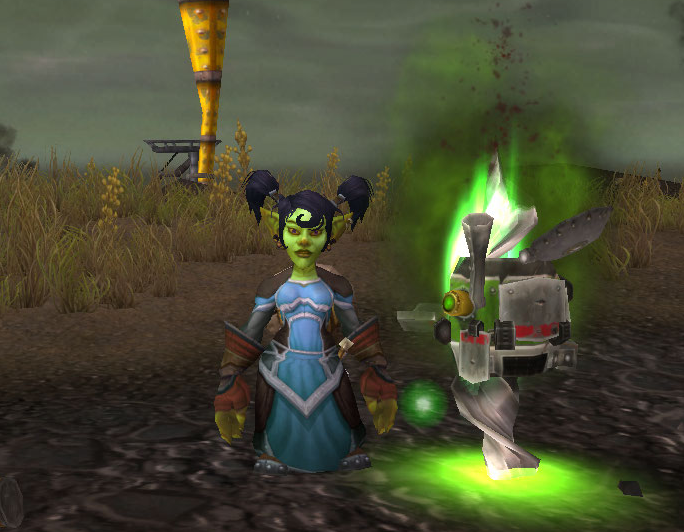 While some of the quests are as predictable in mechanic as any starting area (kill x number of mobs, collect y number of items you’ll find on the ground), others are a lot of fun. 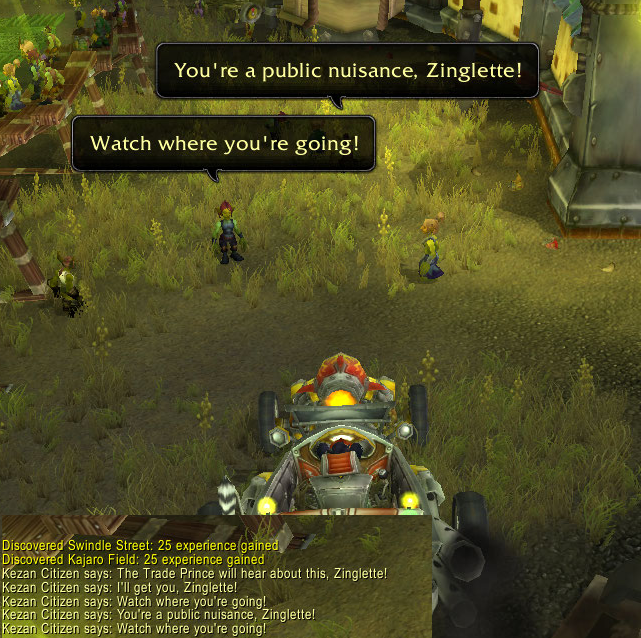 Vehicle type quests that were initially introduced in Wrath of the Lich King are utilised here but not excessively and certainly not to the point of monotony. The same basic mechanic of responding to a trigger with the correct response is implemented for the bank heist quests and while it’s very simplistic, it’s still a nice variation from the mundaneness of normal starting area quests. While not connected to the Goblin starting experience, there are a couple of interface changes that are worth mentioning. The first time you level, you’ll notice the newly designed congratulatory message in the centre of your screen. What you’ll then notice later is upon reaching a level where you receive new skills, these are also clearly stated across the screen. This is a nice addition in my opinion. It stops you inadvertently missing new skills and will be particularly useful for new players. I’m not going to delve into too much depth here so as not to ruin this for other players but suffice to say, it’s very entertaining. 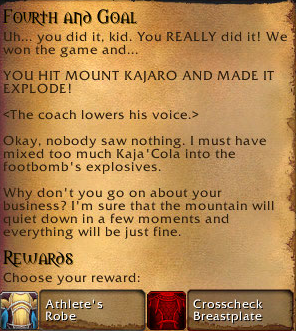 While innocently completing a quest that has you kicking a football into an opposing team’s goal on the Kajaro Playing Field, the ground begins to shake. The quest NPC nervously points out that your winning kick appears to have disturbed the adjacent volcano and lava begins spewing forth. 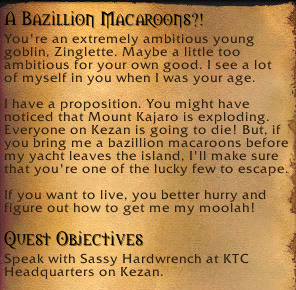 In desperation to flee the eruption, the quest stories centre around you trying to earn an escape passage for yourself and your friends. Finally, the Goblin totems. The screenshots I have seen before do not do these models justice. They look amazing in game and have merely fuelled my totem jealousy more, though I have to say having a totem that is taller than you felt very weird. 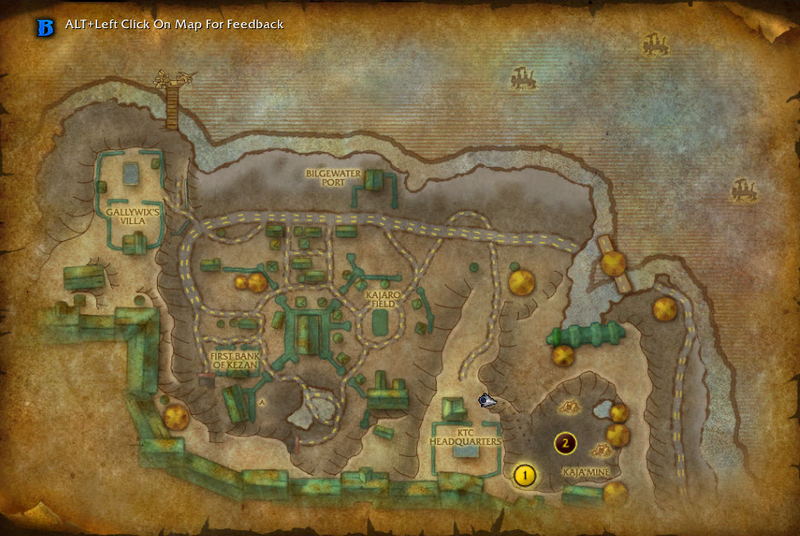 I will be trying the same process with the Worgen starting area though I think the Goblin experience will take a lot of beating. Elemental Mastery – What, When and How? Elemental Mastery is the thirty one point talent found in the elemental tree. It’s also the tree’s only DPS cooldown. With a hefty three minute by default cooldown, how we use Elemental Mastery can be quite critical. Today, we’re looking at precisely that; the most effective use of this significant elemental talent. What Does Elemental Mastery Do? When activated, your next Lightning Bolt, Chain Lightning or Lava Burst spell becomes an instant cast spell. In addition, you gain 15% spell haste for 15 sec. Elemental Mastery shares a cooldown with Nature’s Swiftness. We can split this down into two distant effects. Firstly, is the instant cast component of Elemental Mastery. The second is the 15% increase in spell haste for the next fifteen seconds. When considering the instant cast element, we have two options on “spending” this. Firstly, we can use it on our longest cast spell. Secondly, we can use it with Lava Burst’s guaranteed critical strike to enter a Clearcasting state via Elemental Focus. Obviously these times do not account for individual haste but Lightning Bolt will remain the spell with the longest cast time. Ensuring our longest casting spell is instant provides the greatest benefit to us in terms of DPS. If mana is an issue and you really need Clearcasting active (particularly if your haste is not yet sufficient to drop Chain Lightning from your rotation), then use Lava Burst. The second effect is the fifteen percent increased spell haste for fifteen seconds. Haste is the third most important stat for us (I’m counting hit rating as the first) and as such, this in itself is a sizeable increase to our DPS. As we gear up however, haste effects have to be more carefully timed to ensure we gain the maximum potential we can from them. Haste has several “caps” that dictate it’s value or benefit to us. The first, and the one with which we’re concerned here, is the GCD (global cooldown) cap. This is the point whereby you have sufficient haste to reduce the global cooldown of a specific spell to one second. At this stage, the global cooldown can’t be reduced any further so additional haste will stop benefiting that spell. The last figure it particularly important. 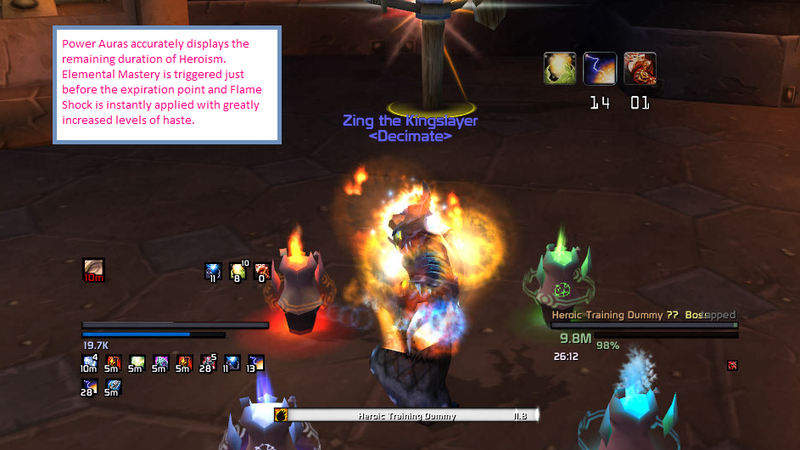 In a raid situation, were you to trigger both Elemental Mastery and Heroism simultaneously, you would only need 778 haste on your character panel to have hit the GCD cap for Lightning Bolt. If you have higher levels of haste than this, you would be wasting a portion of your cooldowns. Even during periods of high movement there is little excuse for not having a Flame Shock running on a boss. As such, this is a quite static 220 haste increase to most elemental players. 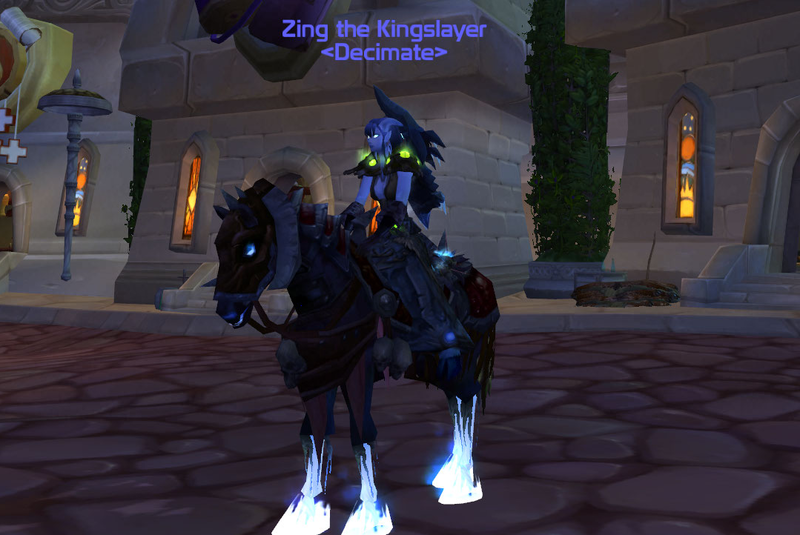 For the majority of the time, the haste levels required to hit the GCD cap for Lightning Bolt are unobtainable (remember that would be 2785 haste with your own Wrath of Air and Moonkin Aura.) When you start considering haste based cooldowns and effects however, it becomes clear that triggering them simultaneously can soon reach less beneficial levels of haste. Based on the above, using Elemental Mastery and Heroism separately is the ideal option. This proves the most problematic on encounters were you pop Heroism immediately. You are torn between wanting Elemental Mastery on cooldown as fast as possible (so it can both be used again as fast as possible and so that you benefit from the two set tier ten bonus – more on this shortly) and not wanting to waste portions of your haste gains due to hitting the GCD cap for Lightning Bolt. On such encounters there is a third option, stacking your haste buffs for a few seconds to apply a double hasted Flame Shock. This tool tip was, in my opinion, never particularly clear. Thanks to the theory crafting over at Elitist Jerks however, the exact mechanic behind this effect soon became clear. The effect always adds the closest number of additional ticks that can fit in a six second duration. 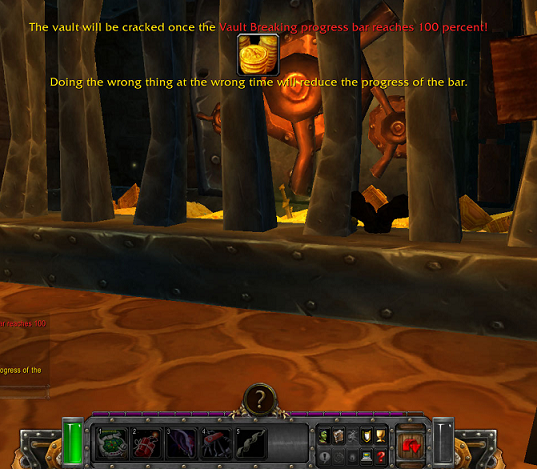 Therefore, the more haste you have, the more ticks can occur in that 6 second interval and the more DPS you gain. 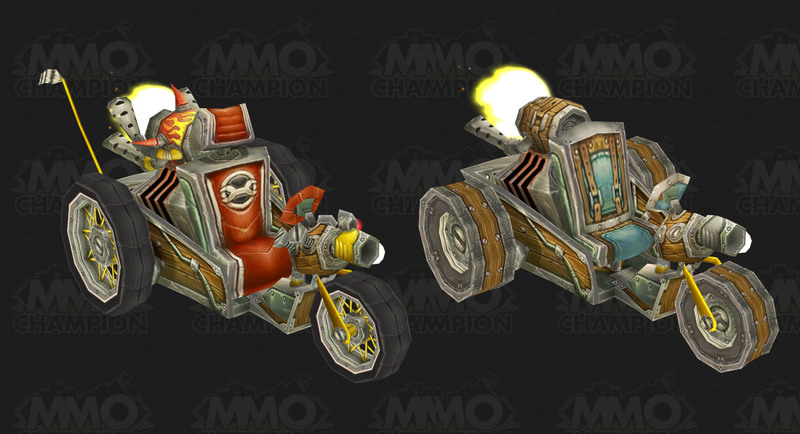 Due to this not only does Flame Shock itself continue to benefit from haste but the tier ten four set bonus also scales very nicely with it. On encounters where Heroism is triggered immediately, I will use Elemental Mastery with a few seconds remaining on Heroism’s duration. This elevates my personal haste to much higher levels than I would normally want. During this brief window, I’ll reapply Flame Shock. This is known as double hasting your Flame Shock. 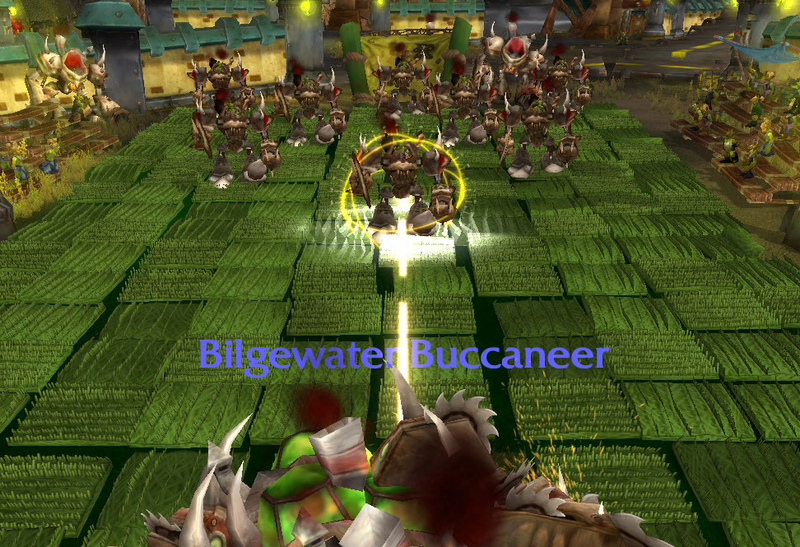 While doing this does provide a DPS increase, it certainly isn’t huge. As such, you’d never want to deliberately save your Elemental Mastery for this reason. However on those few fights where Heroism is used at the start, this tactic can allow you to receive a DPS gain from the Flame Shock whilst also putting Elemental Mastery on cooldown a few seconds earlier than you would if waiting for Heroism’s duration to expire. 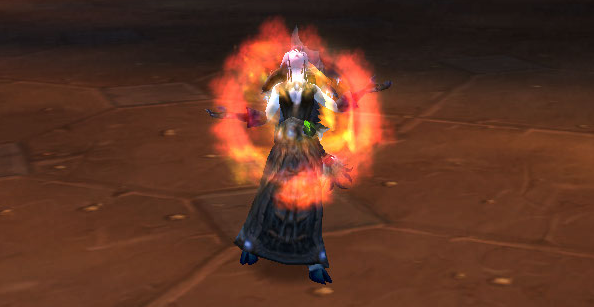 Using Elemental Mastery as much as possible will greatly outweigh the DPS gained from double hasting your Flame Shock. 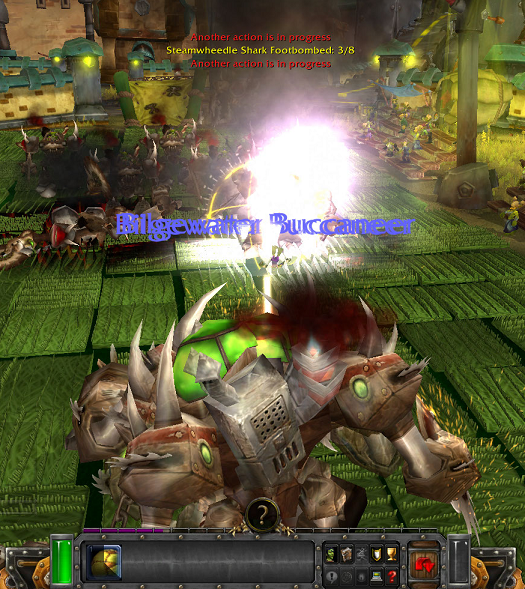 Personally, I use the Power Auras addon to numerically display exactly how many seconds are remaining on Heroism. I’ll generally pop Elemental Mastery at around four seconds remaining and then refresh the Flame Shock. Triggering Elemental Mastery with several seconds remaining on your Heroism reduces the effectiveness of the your cooldown as any additional spells you cast during this window of opportunity will be GCD capped. It can take a little practice to get entirely comfortable with the timing for this but it does allow for a small DPS increase. There are exceptions to most rules and there are some encounters with a specific “burn” phase where saving Elemental Mastery might be beneficial. While this sounds good on paper it is, sadly, a little situational. On encounters with a great deal of movement the benefit of this bonus plummets. Simply put, the more we move the less we cast. 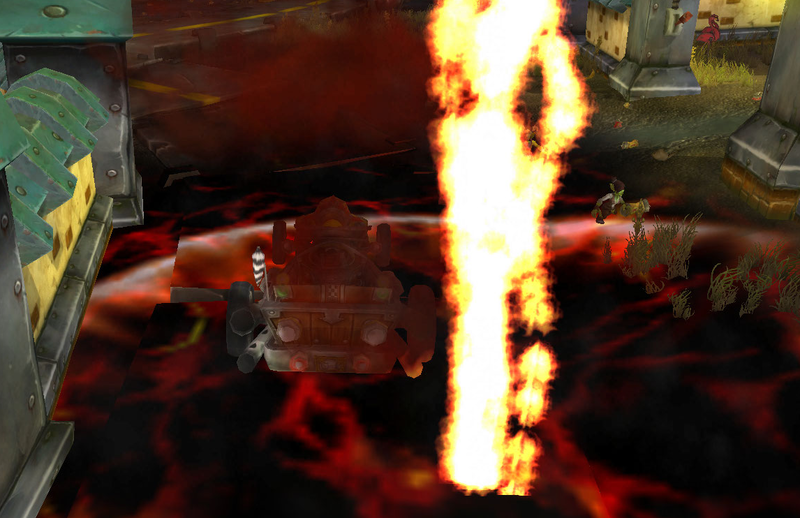 In addition, due to the priority system of the elemental rotation, Lava Burst remains our priority. It is our “filler” spells that suffer the most from movement fights and sadly, it’s these spells that work to reduce the cooldown of our Elemental Mastery. How exactly does this two set bonus work? Every Lightning Bolt or Chain Lightning spell we cast takes two seconds off the three minute (180 seconds) cooldown of Elemental Mastery. The two set bonus is worth around 100 to 150 DPS at it’s best but as stated at the beginning, it suffers terribly on high movement fights. The best way to increase the effectiveness of this potion is to use it during periods of high haste. This means we’ll be casting more of this buffed offensive spells than we would without haste effects. Elemental Mastery’s haste increase can cause problems with the GCD cap of some spells. Chain Lightning, for example, only requires 50% haste to be GCD capped. The general rule of thumb I follow for Chain Lightning use (which you can read about in depth here) is that if Chain Lightning’s cast time is shorter than 1 second, I drop it from my rotation. Obviously this means that during Heroism, I’m primarily spamming Lightning Bolt. 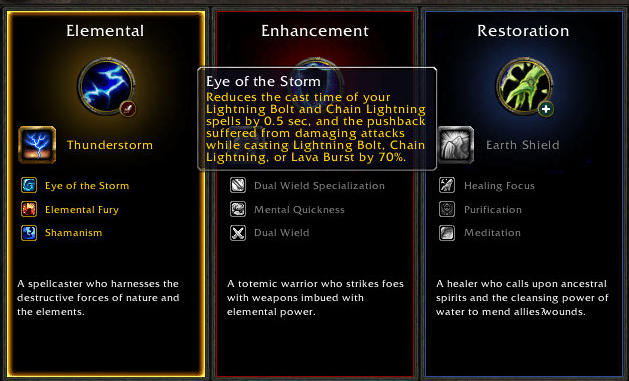 Elemental Mastery doesn’t have the the same potency of haste increase offered by Heroism but depending on your personal level of haste, you may find the need to drop Chain Lightning from your rotation while the Elemental Mastery buff is up. In my case, Chain Lightning’s cast time slips to just under 1 second during the increased haste of Elemental Mastery. As such, I only incorporate Chain Lightning into my single target rotation when I have zero haste effects ticking. This results in a 5% increase to the spell haste it rewards (20% up from 15%) in addition to a 15% increase in damage to our fire, frost and nature spells. Your Lightning Bolt and Chain Lightning spells reduce the remaining cooldown on your Elemental Mastery talent by 1 sec.